Technically advanced, environmentally conscious and incredibly comfortable, the Men’s Ellipse Jacket is a hybrid-construction midlayer that uses strategically-zoned insulation for warmth and protection where you need it most. In the chest panels we used Icebreaker's MerinoLOFT™ insulation, which provides a warm, breathable and natural alternative to synthetic insulations, with a 100% recycled polyester face fabric. In the body and arms the Ellipse Jacket features a super-soft and quick-drying blend of merino wool and recycled polyester with side stretch panels that actively manage moisture during cold, high-output days in the mountains or out on the trails. Zippered hand pockets and an internal stash pocket secure all your small daily essentials. Ellipse Jacket - Mens is rated 4.9 out of 5 by 39. Rated 4 out of 5 by Keenan from Nice light layer for shoulder seasons I bought this for early morning/later in the evening whether sitting by the campfire or on a hike. The sleeve material is not insulated which is both good and bad. When you are moving around the lack of bulk is nice but when you sit down and rest, it would be nice to have a bit of extra wind protection or warmth. That being said, there is no perfect garment that covers all these conditions - that is what I view layers as being for. I like that it is more of a slim fit as I have a slim build. There isn't extra bulk that gets in the way. This also assists with layering and putting a shell overtop. Overall, a very nice addition to my outdoor wardrobe. Rated 5 out of 5 by HikingJason from Great for cool, windy days Had been thinking about something like this for a couple years. Hiking in the fall, early/late winter, and spring, I often find I can’t layer up as much because I get overly warm, but my chest and stomach get cold. This is great for providing some insullation and windbreak on your front while giving your back and arms lots of ventilation. Very happy with this product so far. Used it on about 5 hikes in the Rocky Mountains so far this winter. Rated 5 out of 5 by slybike from Another good tool to hit the mountain Impressive as so many Icebreaker clothing. Versatile, fit well, useful for medium to High intensity sport or for mid layer in polar weather day. The wind stopper front panel is what is jacket/shirt is all about. In all case it feel like you have nothing ( it's super light & the back make it breathe very well). The small poket is also usefull. Rated 5 out of 5 by ScottS from Best Mid Layer I've Owned Canadian winters can be harsh, but owning this mid layer has been amazing. I often wear it underneath my jacket on -18C or colder days, and sometimes just keep it on at the office because it's so comfortable. As a reserve soldier, I also pack this during our winter Exercises to wear with my Icebreaker base layers (and it's green). They serve me well in colder weather to help regulate my core temp. Rated 5 out of 5 by badong92 from Ellipse long sleeve zip This is an excellent long sleeve zip. Now that cooler months are coming so it is the best time to use it. Tried it below 10 deg celcius and just kept me warm. Love the merino loft. I like it being slim fit as it hugs your body. Very light and warm and the fabric is so soft. Do a lot of hiking and scrambling so I will use this and put it to test but knowing it’s Icebreaker, I am sure its tough. Rated 5 out of 5 by Altaberg from Perfect multi-purpose & lightweight layer This is the perfect mid or top layer for cross-country skiing, cycling, hiking in a variety of temperatures. 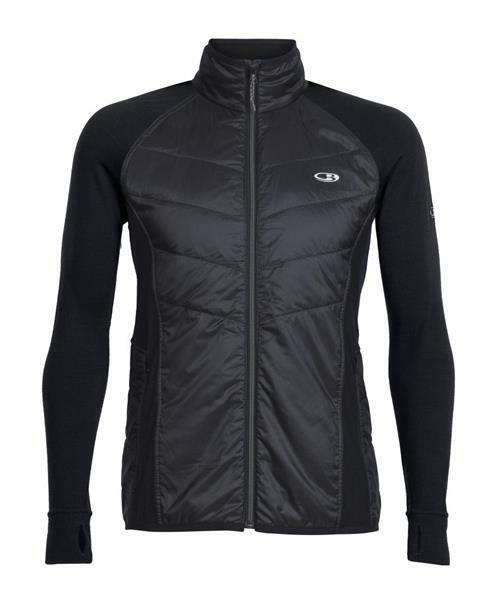 Good mid-layer for really cold temperatures and nice top-layer for not quite as cold for high output activity. The front panel is nice for going fast skate skiing .... The arms are nice and snug, even for bow hunting. Rated 5 out of 5 by Ramy from Perfect all around sleeve I'm 6 foot and 160 pounds and it fits adjusted. So perfect fit for me. Comfortable and light, I can't wait to try it during cross-country skiing and winter running. But for now it's perfect for chilly hiking and chilly nights. Rated 5 out of 5 by likeitis from Quality Product Fits larger than I usually like, so I did order the medium, though, the site indicates a large for me. SIzing has been an issue with Icebreaker, but I am learning to adapt to this. Same for t-shirts.